Booth Alley, parallel to and running between Swan and South Division streets, is one of the few remaining alleys in downtown Buffalo. 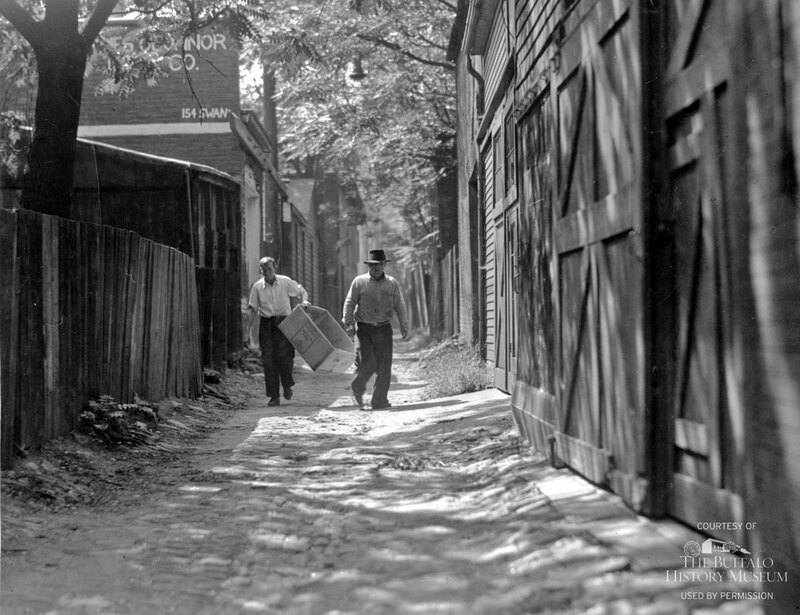 This undated photograph, taken by Wilbur H. Porterfield and looking west along the 11-foot-wide alley from Michigan Avenue to Elm Street, offers a perspective that would be unrecognizable to viewers today. In 1940, 17 buildings existed on this block; today, only three remain. At the time, the block was home to the Gutman Building, a handful of stores and restaurants, and stately if dilapidated Civil War-era mansions, most converted to rooming houses. A sign for James O’Connor junk dealers, 154 Swan Street, is visible on the upper left. In newspaper accounts, Booth Alley was called a “dimly lighted little thoroughfare which contains principally shadows,” and was frequently a setting for robbery and murder reports. Porterfield, however, had an alternative view, and in 1945 called Booth Alley one of his favorite spots to snap photographs. Booth Alley is a survivor, but the list of vanished downtown alleys grows by the decade—Alaska Alley, Seward Alley, Kremlin Alley, Webster Alley, and many others are now found only on old maps. Today, this section of Booth Alley is barely discernible as a public right-of-way, and could easily be mistaken as a private drive for the parking lots that make up 88 percent of the area of the block.